One of the great pleasures of international travel, for me, is the discovery of another country’s books, writers and illustrators. My latest trip, to New Zealand, was no exception. 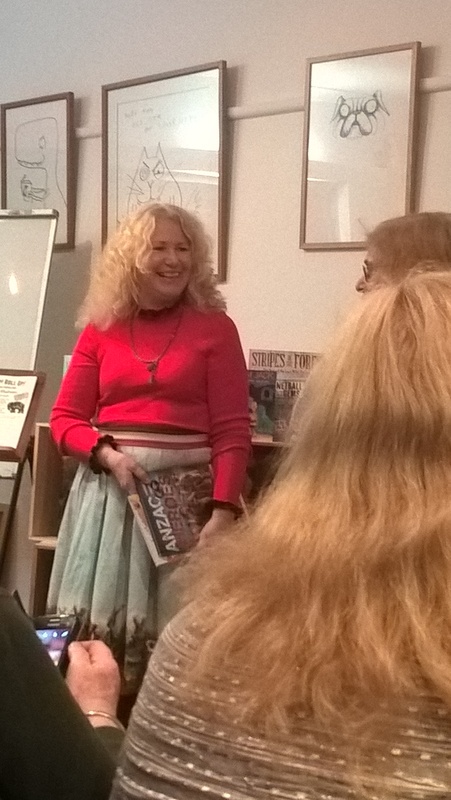 Through visits to schools, bookshops, libraries and attending the IBBY (International Board of Books for Young People) Conference in Auckland, I was introduced to the work of the country’s fabulous authors and illustrators for children, and also met several of them in person. To my shame I also discovered how little I knew about New Zealand books–I had read and loved the work of world-famous creators of children’s books like Margaret Mahy, Lynley Dodd, Pamela Allen and Maurice Gee, but otherwise I knew very little. I’m not alone in that, in Australia: our cousins across the Tasman might be so close but we know more about British or American children’s literature than we know about that of New Zealand. Anyway, I decided I’d do my small bit to remedy that, not only by buying and reading lots of books but also by presenting interviews with some of those fabulous creators! The first interview is with distinguished writer of non-fiction for children, Maria Gill. Her most recent book, Anzac Heroes, which is about the stories of great men and women from both New Zealand and Australia, from both World War One and World War Two, has recently won not only the top non-fiction award in the 2016 New Zealand Book Awards for Children and Young Adults but also the Margaret Mahy Book of the Year Award. The judges praised the book as ‘simply stunning’ with ‘carefully chosen material’, and it’s been flying off the shelves both in New Zealand and Australia. I caught up with Maria to talk to her about it. How did you first get the idea for Anzac Heroes? How long did it take to go from concept to publication? I had written two other books about the lives of famous people (New Zealand Hall of Fame, New Zealand Sports Hall of Fame) and when I saw the commemorations for WWI I decided to do another about Anzac Heroes. It was a year of solid writing (from 8am – 6pm, seven days a week), and I also spent two months applying for a grant, organising photographs, editing and getting experts to check the book. Anzac Heroes is a major work of research but also selection. How did you go about that? What were your criteria in deciding who to include in the book? Did you have an initial list in mind, and did that change as you went along? What were the challenges and discoveries involved in the research? First, I included army, navy and air force men who had won Victoria Cross medals that fought in a range of battles. However, as time went by my conscience was nagging me; I wanted to include indigenous soldiers and women. I looked closely at what being a hero means; it’s about being exceptionally brave, resilience in the face of extreme hardship, and putting your life at risk to save others. Even though Maori and Aboriginal soldiers were mostly given the jobs of digging trenches and tunnels they volunteered to fight or go out on scouting missions that were incredibly dangerous. Same with women; they weren’t allowed to fight in both wars, but they were near the front line, avoiding bomb and bullet fire to save other people’s lives. Indigenous soldiers and women didn’t receive the highest medals but they absolutely deserved to be included and the book is all the more richer for it. I had difficulty finding information about some of the lesser known men and women in the book. It required detective work; but for me, the more difficult it is, the more determined I am to find their story. I investigated primary sources such as battalion log books, military records, diaries, and letters; as well as secondary sources such as historical books about certain battles. For Aboriginal soldier Albert Knight I rang people in his home town until I found a family member. They told me to ring other family members and between them we pieced together Albert’s story. They were really thrilled his story was finally being told. The book is lavishly illustrated with pictures that are well-integrated with the text. 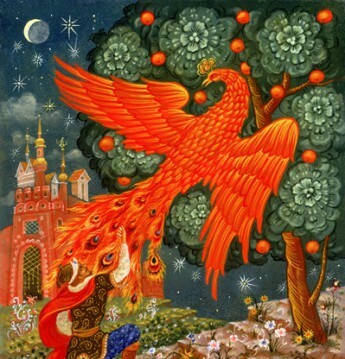 Did you work with the illustrator, Marco Ivancic, on that, or were you both creating your part of the book separately? I was visiting a lot of museums to find information so every time I went I took my camera and shot lots of images for Marco to use as photo reference. I also spent a day with a military re-enactment group taking close-ups, mid-range and long-range shots of them at all different angles. I also sent him any photographs I had discovered online of the men and women. The Anzac stories are still very inspiring and important to Australian and New Zealand readers. Why do you think that is? I think it shows how human kind can survive in the harshest of conditions and be strong, brave, and kind despite what is going on around them. I’d like to think young people will read how difficult it was for the men and women during those two wars, and grow up thinking that war should not be an option to solve problems. The stories also tell of significant historical events that shaped our identity. Your book has been very well-received, both in New Zealand and Australia, and has major awards. What’s been the reaction from young readers? Lots of boys have said how much they want to read the book or bring their own copy in for me to sign it. In a school in Brisbane a young girl came up to me and said she wanted to thank me for including indigenous soldiers because she was Aboriginal and it meant a lot to her that they were included. You specialise in non-fiction. Tell us about your other books. And what are you working on now? I’ve written a picture book (The Last of Maui’s Dolphins), several creative non-fiction picture books (Operation Nest Egg Chick, Rangitoto, The Call of the Kokako) and over 40 educational books for children and teachers. At the moment I’m working on a follow-up to Anzac Heroes due to be published in 2018 with Marco Ivancic as the illustrator. Maria Gill has written 60 books over the last 14 years. 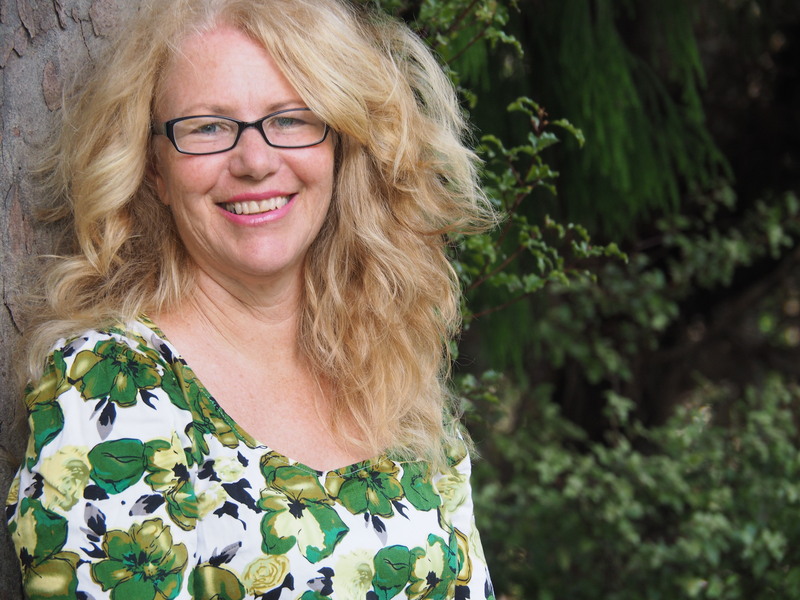 Seven of her books have been finalists in national children’s book awards including ‘Anzac Heroes’ in the 2016 New Zealand Children’s Book Awards. 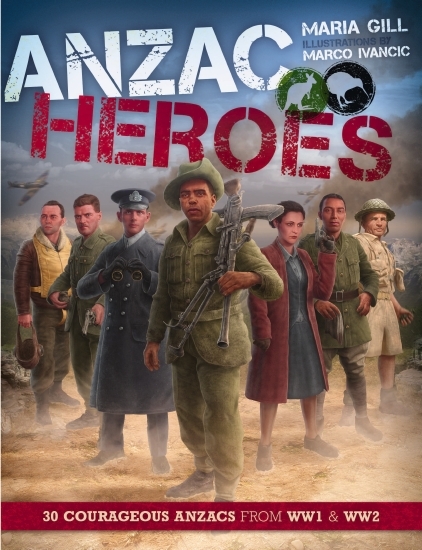 ‘Anzac Heroes’ won the non-fiction category and the Margaret Mahy Book of the Year Award. Maria trained as a Primary school teacher and journalist, but now writes children’s books and educational resources full-time in a small seaside village in New Zealand. www.mariagill.co.nz. ← Cover reveal of Once Upon An ABC!